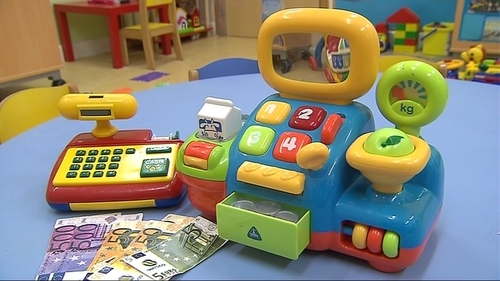 All parents with a child attending a Tusla registered childcare service will receive a subsidy of up to €87 a month towards their childcare costs, from today. The subsidy will be available for all children between the ages of six months and three years and will be paid directly to the childcare provider. Providers must be registered with Tusla in order to receive the subsidy. Minister for Children and Youth Affairs Katherine Zappone has said the supports are the beginning of a radical new change in which childcare operates. She urged creche owners to show restraint when it comes to rising their prices, following reports that fees are being increased to absorb the grant. Speaking on RTÉ's Morning Ireland, the minister said 2017 will see an investment of €466 million by the Government which she said was up 80% on 2015. Ms Zappone said to date 76% of creches have signed up to the childcare supports scheme. The evidence so far, she said, is that some creche providers may be increasing their prices by up to 6%, but that 80% are not increasing their fees. Ms Zappone said: "I am really very keen that creche providers ensure that if they feel they need to increase their fees, they show restraint, that any indication or examples of a pattern where fees are being increased that are not reasonable, that don't cover the cost, this will mean I will take action. "Some of the action will be to consider regulation or price caps." The St Vincent de Paul charity has said the cost of educating children is a formidable burden on families. The charity received a record number of calls last month including more than 5,000 from parents and guardians seeking help to meet back to school costs. It said that it often sees families cut back on essentials such as food and heating because of back to school costs. Tricia Keilthy, a spokeswoman for St Vincent de Paul said families approach the charity for help with utility bills or food purchases because of the pressure of buying uniforms, books and other materials. She said that for parents and guardians on low incomes, the preparation for the new school year had been a source of great stress and anxiety, with the prospect of further requests throughout the year for contributions for education, exam and extra-curricular expenses. The charity is calling on Ms Zappone to start to make free education a reality with proper funding for schools and additional supports for parents.